If you've ever wanted to upgrade your old countertops to granite, but thought it was too pricey - think again. Danny Lipford, a home improvement expert and host of "Today's Homeowner," says getting the look of granite is easy and affordable. 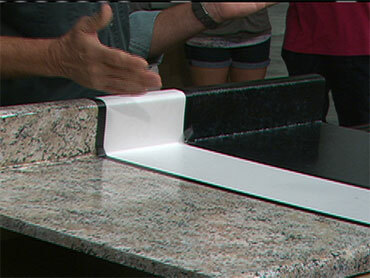 Lipford says you can give dull laminate countertops a stunning granite look with a countertop paint kit. A kit by Giani costs $49.95 and requires a series of simple steps involving paint brushes, rollers, sponges and paint. The kit can be used on plastic laminates and wood. Click on the video below for Lipford's demonstration on "The Early Show."